This quest for the perfect fit has never left Dennis. Hired in 1971 by Jonas Brothers of Denver, his skills were quickly noted. Within a year and a half he was named foreman and chief sculptor of the taxidermy studio where he remained for eight years. In 1984, Dennis joined the staff at McKenzie Supply to specialize in sculpting shoulder mounts. Since then Dennis has created extensive and innovative lines of African, mule deer, elk, sheep, caribou, pronghorn antelope, and whitetail deer mannikins. The forms he sculpts have been thoroughly researched and tested. Dennis’ research is ongoing, so he can provide taxidermists with the best fit possible. He has been at the forefront of innovation in gamehead mannikins. Dennis is responsible for many “firsts” in the industry, including the first 90 degree elk form (to provide antler clearance) back in the early 70’s, the first molded-in bugling elk mouth, the creation of the first “wall-pedestal” forms for which he coined the name, and the invention of the “pre-rotated” glass eye. In 2014, Dennis celebrated his 30th year with McKenzie. Dennis’ taxidermy and sculpting skills have been fine-tuned and developed for 55 years, making him one of the most experienced craftsman in the industry. Dennis pursues his sculpting in the fashion of a true perfectionist. He has won numerous awards at the National and World competitions, including the first Coloman Jonas award. In addition, he continues to give seminars each year throughout the country. He is also an avid bowhunter and photographer and continues to make numerous study trips each year. I have mounted many animals on Mannikins sculpted by Dennis and other sculptors like him.It is because of men like him that our profession has risen to the level it is today.I also have a question, I have sculpted a few Mannikins that I use in my shop and I am interested in sculpting some for use by the supply industry .Any advice? David, I am often asked this question and my advise always starts with the same caution: be sure that the forms you make use no parts from any existing production manikin. 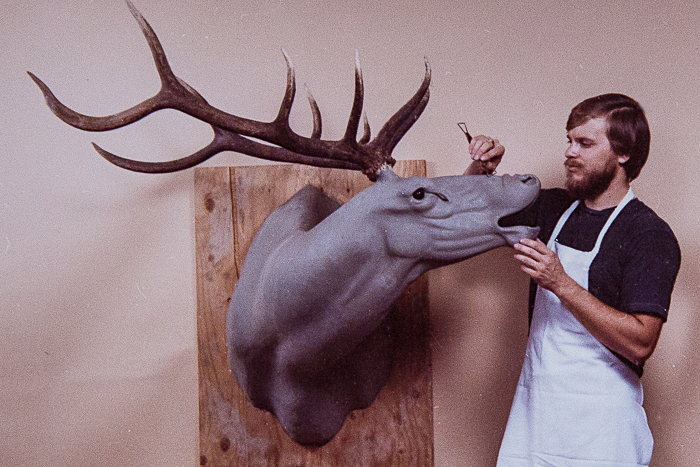 Over the years many taxidermists have taken an existing form, perhaps made some position change, do their own thing over the surface with clay, and call it their own creation. This is not really sculpture. It is in reality simply a “tweak” of someone else’s hard work, countless hours of labor, study, effort, and ability. To call it your own would mean that you started from scratch, using your own research and your own self-made armature (the base on which you apply the clay). Hey Ken, if the deer was mine, I would set the eyes in the the pre-sculpted eye socket just as I would any other mount. The only change I might make for the age would be to model the upper brow and lid a bit heavier than usual but I would let the skin dictate how much (obviously don’t over-do it). Hope it turns out well for you! Hi Dennis, in 2015 I got my first mount done on one of your wall pedestals. I just got another buck and I was planning to use the same form but with the opposite turn. My issue is that I am not 100% sure which form I have. My taxidermist wrote down 9800 on my receipt, but to me it looks more like an 8800 based on the catalog pictures. I was hoping that if I sent you a picture of my mount that you would be able to know which form it is. My email should be included in message, so if you could reach out to me I could email it to you. Thanks for making some great forms!